← Does Your Technical Resume Need a Cover Letter? Throughout their IT careers, technical professionals work in a unique blend of business and technology. Their environment contains all the factors that can lead to conflict and frustration―unrelenting change in tools and techniques, methodologies, business requirements, economic climate, customer expectations, and people. Teamwork provides the foundation that makes all of this change possible and sustainable. Some years ago when I decided that I needed to make a career change, my long-time mentor helped me to write a career objective that was for my private understanding of what was most important to me. I don’t remember the specific statement but I do remember that it struck a strong chord with my heart. I’ll paraphrase here, “I want to be part of a closely knit team that produces amazing results.” For me, there is nothing like working as a team to have fun and do great things! These are a collection of my thoughts about the value of teamwork. People are diverse and they come with different experiences, beliefs, behaviors, approaches to work, expectations, needs, interests, and much more. A good team leader understands and supports the diversity within the team. Becoming part of a team means adapting to the team and its culture. 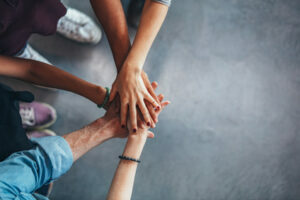 Building a team means that the team adapts to its members and their uniqueness. Each member brings their unique selves to the team environment. Therefore, having an understanding and an appreciation for these diverse characteristics and incorporating them into the work place makes a team innovative, resourceful, and successful. Each member brings a different perspective on how they contribute to the team’s objectives. The members contribute differently using their skills, knowledge, experience, and talents but they contribute to a shared success. It is this shared bond that makes the team strong. Every individual within a team is part of something larger and more important than themselves. They make a commitment to the team’s success and to the success of each of its members. Furthermore, they understand that the whole adds more value than the sum of the parts. How we think describes the beliefs and values that we bring to our team. How we act describes the behavior we exhibit. How we work describes the ways that we work within the team. All of these determine whether we’re able to build a team or only put together a group. buying-in to the goals. They believe that the goals are important and that their individual contribution is important to achieving the goals. In conclusion, your entire IT career will be a collaborative effort whether you are leading teams or contributing at the individual level to the success of a team. As you look at companies to target for career opportunities, network with colleagues and friends to learn about the company’s environment. Once you have been part of a great team, nothing else will do. This entry was posted in Building Your IT Career, Uncategorized and tagged IT careers, IT Job Search, Technical Careers, Technical Job Search, technical resumes. Bookmark the permalink.